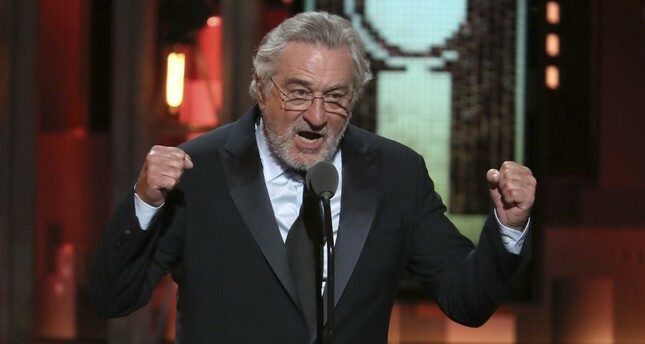 Before introducing a performance by Bruce Springsteen at the Tony Awards, Oscar-winning actor Robert de Niro used some profane language to criticize U.S. President Donald Trump, June 10. Although recent events show that Hollywood's political stance is not reflected in society, political activism by celebrities continues full steam ahead in the U.S.
Last week, we talked about the fictionalized nature of fiction, so let's continue in the same vein. But this time let's look at the politicization of people prominent in related sectors rather than the mediums themselves. Ever since the early 20th century, Hollywood has been the trendsetter in global filmmaking, with its films transcending national borders, demographics and cultures. It is also one of the chief sectors that both represents and influences American culture. Its cultural and political statements reach other countries solely through their end products with varying degrees of success, but in the United States, the people behind the products are every bit as influential as the products themselves. At least that was the assumption until lately. Political stances held by celebrities, ranging from actors and actresses to producers, are not a novel concept. Anyone who looks at past political events, such as protests, lawmaking and so forth, can see celebrities throwing their weight as soft power to support the causes they stand for. One of the most prominent examples would be celebrity endorsement in presidential races in recent history with actors and actresses lending their support to political candidates in rallies to influence their fans towards their own political alignment. Yet in the aftermath of the recent U.S. presidential elections that resulted in Donald Trump's victory, it appears that celebrity endorsements might very well play an insignificant role if not a detrimental one. During the months that led to elections that took place after candidates of the Democratic and Republican parties were determined, the situation looked dismal for the Trump camp as far as celebrity support was concerned. A vast majority of big names in Hollywood were throwing their support behind Hillary Clinton in never-before-seen numbers and with great enthusiasm. Sure Trump also received a bit of that star power but compared to his opponent, it was not that impressive. Trump himself was a bigger celebrity than almost all of his celebrity supporters after all. Yet at the end of the day, celebrity endorsements were scorned unlike in any previous elections, serving to solidify Trump's camp as his voters sought to spite the "Hollywood elite," while they failed to adequately galvanize Democratic voters to score a win. It appears that Hollywood no longer possesses the same influence as it once had as far as the political arena is concerned. There are a couple of reasons for this. The first would be Trump's strategy when approaching the disparity of his celebrity endorsements compared to his opponent's support in that regard. By adopting populist statements that painted Hollywood's big names as "Hollywood elites" out of touch with the political and everyday factors that affect society, he managed to diminish the effects of endorsements. Considering that the political demographics of the sector were quite different between big names and staff, it found purchase in the minds of his supporters. His shots at celebrities, of course, caused more celebrities to speak out on political subjects as they endorsed Hillary Clinton, while also returning fire at Trump. From late night shows to social media, this constant barrage served Trump once again just as it did with the mainstream media's negative yet constant coverage of his campaign. It brought exposure and it painted Trump as the political underdog that stands for the common man against a cadre of elites. And everyone loves an underdog. The other reason behind the waning political influence of Hollywood celebrities is one that was long in the making. With social media heavily employed by celebrities, it brought scrutiny that left them far more exposed than ever before. They no longer interacted with their fans in controlled environments but with the frankness and intimacy of Twitter and its counterparts. However, this was also a Cinderella moment that eroded the weight of their political stances if there was no legitimate weight behind them. This also allowed unfiltered political comments uttered in heated moments. These statements without a lot of thought and rationale behind them alienated moderate views while fueling the anger of people who were in the crosshairs of those comments. Not to mention that these unfiltered statements that carried all sort of bad optics with them reflected negatively on candidates endorsed by the celebrities behind those statements. Two years after the elections, Hollywood continues to be as political as ever, with the same methods and increased ferocity. Time will tell whether its political views will be reflected in the general public or if they will receive a similar result down the line.